Yet without organisational alignment every other success factor suffers and the organisation’s ability to bring the enterprise strategy to fruition will fail. Most observers regard Organisational Alignment as something that relates only to the employees of an organisation. They use a three part definition as follows. However before the staff of an organisation can be aligned, the organisation itself needs to be aligned as well. Management has to determine the current reality; management has to agree an overall goal; management has to develop the strategies to achieve it and, lastly management must allocate responsibilities to everyone in the organisation so each may play their role in its implementation. And at the core of this whole exercise is a matching process – let’s call it Enterprise Alignment. It’s the matching of the current and future trends and characteristics of the organisation’s external environment in which it operates with its current and future resources and expertise. In short Enterprise Alignment is a prerequisite to Organisational Alignment. Let me illustrate this with two examples. The first involves skeins of migrating geese so beloved by management consultants as exemplars of teamwork. It’s a powerful, emotive analogy but the basis of their performance and subsequent teamwork is Organisational Alignment. The geese can only demonstrate the essence of teamwork because the members of the skein agree where they are now, share a common objective, know the direction in which they need to fly and understand the roles each need to play when the skein is in flight. Even more fundamentally, the need to migrate from A to B at particular times of the year is hard wired into geese. Yet such is their sensitivity to short term climatic change, they will alter both the timing of their migrations and their route according to climatic conditions. This is their version of Enterprise Alignment. The second example also concerns flight – namely the Boeing 787-9’s recently ordered by Qantas as a key strategy in the rejuvenation of their International division. Qantas CEO Alan Joyce set three criteria as prerequisites for ordering Boeing’s Dreamliner – Qantas International had to be returned to a position of sustainable profitability; the Company had to be capable of paying down its $1 billion of debt and the Qantas long-haul pilots union had to accept changes to the terms and conditions of their employment. The reason for the selection of the -9 variant of the B787 is simple. Its long range – Qantas are investigating non-stop flights from Australia to London – provides Qantas with a resource that matches the trends in international air travel. Now the fact that Qantas made a Profit Before Tax of $975 million in the 2014/15 Financial Year is clear evidence that Joyce has achieved Enterprise Alignment. The task that has already successfully begun is to develop greater Organisational Alignment to provide the internal environment in which change can be achieved without the sort of industrial conflict that led to the grounding of Qantas in October 2011. An agreement between Qantas and the long-haul pilots union has now been struck which is a perfect illustration of Organisational Alignment at its most productive. This is what Qantas pilot and president of the Australian International Pilots Association (AIPA) – Nathan Safe had to say about the negotiations over the new agreement. “These changes (to the then current agreement) have been based around building a viable business case for the type of ultra long-range flying capable of being performed by the 787. We have been pleased with the quality and tone of the negotiations …….. and we note the unprecedented level of transparency and sharing of commercially relevant information”. Note the word “unprecedented”. Sharing commercially relevant information was not a hallmark of the previous CEO, Geoff Dixon. Much of the agreement between Qantas and the AIPA remains under wraps because to make it public would have given too much away to Qantas’ competitors. However, with Alan Joyce’s background in scheduling and network planning, one can rest assured that the destination and the journey have been clearly defined and shared with the pilots. Building the commercial case for buying and operating the B787 was not solely dependent on securing the cooperation and support of AIPA members. Everyone from baggage handlers and cabin crew to aircraft maintenance engineers have bought into the plan by signing new agreements on the terms and conditions of their employment. Having suffered all the pain of recent years, everyone in Qantas International understands the significance of the B787-9 purchase in placing Qantas on the offensive once again and no one wants to jeopardise its success and the beneficial impact that that would have on job security and career opportunities. In my book “Execution to Die For – the Manager’s Guide to Making It Happen” I refrained from claiming that any aspect of implementation was ‘the most critical’. Without alignment of the enterprise with its external environment and of the employees within the enterprise, no organisation of any shape, size or form can fulfil its potential. So before you rush off to sign up to some program on employee engagement, effective communication, change management or leadership, you need to ask yourself a simple question. Is our organisation aligned? And if it ain’t, no amount of training in the aforementioned skills will make an iota of difference. It’s doomed to failure. Graham Haines is the principal of Plans to Reality, a consultancy that specialises in the issues of implementation. His most recent book – “Achieving Execution to Die For – a Simple Guide to Making It Happen” – condenses the complete operational cycle from planning and execution to monitoring, measuring and modifying into a mere 18,500 words, taking an hour to read. It also identifies 36 barriers to great execution and how to overcome them. The book is available in hard and soft copy from his web site – http://www.planstoreality.com.au – and you can download the first section of the book – “The Purpose of this Guide and how to use it” for free. I’m a bit of a bower bird when it comes to quotations and one that I have always treasured is by 19th Century reformer, essayist, critic, artist – John Ruskin. “What we think, or what we know, or what we believe, is, in the end of little consequence. The only consequence is what we do”. The ability to get things done – to make it happen – is the quality that most distinguishes great managers from those that merely bear the title as descriptive of the role they are charged to perform. Great managers are rare – so rare in fact that the best of them end up being feted by their peers, honoured by their governments and writing their memoirs. Given that the ability to execute is the ultimate worth of a manager, one would think that execution would find a place in any university degree program, particularly those programs that have an emphasis on management or HR. Instead what we find is a modular program structure where each topic or subject is a self-contained unit. This modularity facilitates program reviews as units that are thought to have passed their use-by dates can be unplugged and new units inserted. The great majority of these units relate to the technicalities of the subject studied. I have no problem with this. After all, if I employ an IT specialist or a chemist or if I use the services of an Occupational Therapist, then my first requirement is that those people have a technical grasp of the discipline that they have chosen to study. BUT … if our salesman or brand manager or accountant is any good at his or her job, inevitably they will either be promoted or, if promotion is denied them, seek employment with another employer to further their career. Quite suddenly, the emphasis of their job and the skill set they need to perform it, changes. The hard technical skills become less important than the soft people skills. The key to their success in managerial positions lies in their ability – to quote Dwight Eisenhower – “to get someone else to do what you want because he wants to do it”. It’s still necessary to do the right thing – but hopefully the technical skills will take care of that – the challenge is to do it right – and make it happen. Conventional wisdom has it that such managerial and leadership skills are learned on the job from your supervisor or manager. I would argue that the current work environment is not conducive to this happening. My anecdotal experience is that the standards of people management are in decline. So shouldn’t it be taught at university? By “it” I don’t mean a unit on teamwork or one on leadership or another on change management – I mean a unit on execution from whoa to go that incorporates all aspects of making it happen. Yet there seems great reluctance on the part of academics to even consider such a unit. A couple of years ago, I gave a 20 minute presentation on this subject to the members of a Commerce Advisory Board at the University’s Faculty of Business and Law. At its end, despite the fact that no one argued against my hypothesis or questioned any aspect of the hand-outs that were given, there was not even a reference to my presentation in the subsequent minutes of the meeting! Was this an oversight or was it a deliberate attempt to bury the topic? I suspect it was the latter because I subsequently wrote an article entitled “The Human Side of Planning” in which I claimed that the seeds of success or failure to implement were sown the moment the planners sat down to plan. The article was submitted to the Editor – himself an academic – of an international journal on management. I quote from the email of rejection. The reviewer went on to say that “Your article, however, is more holistic and extensive and is more appropriate for a practitioner audience (who would be interested in this type of perspective)”. 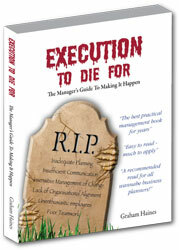 When I asked another academic whether he would consider using my book “Execution to Die For – the Manager’s Guide to Making It Happen” as a reference for his students, his response was that he couldn’t do this because of the lack of references to other publications. In reality the book has over 50 references but the majority are to people who have been there and done that – or haven’t done that – not to academic research programs. I can only conclude that academics won’t contemplate the inclusion of a unit on execution. But even if they did, I have doubts as to their ability to develop such a unit. As the reviewer of my article said, the subject matter “is more holistic and extensive” and thus by inference would not be of interest to academics. And I only wrote about a small part of the overall topic! Nevertheless, if the subject matter is not of academic interest, it seems a fair conclusion to make that academics would have great difficulty in developing a unit on this topic. I’m not suggesting that no academics have the ability to appreciate the inter-connectivity of our existence or the ability to weave topics and issues into a cohesive tapestry but the trouble is, they’re all on television making documentary series! I appreciate that some universities now promote “personal edge” and “capstone” courses but again I would argue that these are still stand alone and rely on the student’s own capacity to see any connections between them. Great execution is a process and, like any process, a) the steps to it are in a specific sequence and b) they can be learned. Still, one might hope that units on team dynamics, interpersonal skills and the adoption of a global mindset might enhance a graduate’s ability at execution. This is not the case. There are too many factors in the current organisational environment that militate against great execution. Change is too frequent; competition between employees is intense; job security is a thing of the past; tenure in the one position has become shorter and shorter – and all these factors develop a “me” rather than “we” mentality. And yet the great achievers, when asked about the reasons for their ability to make things happen, all give credit to the employees they manage. “It was a team effort” is the almost inevitable comment. It seems to me to be a sad state of affairs that an understanding of what’s involved in developing plans and bringing them successfully to fruition through others is not part of the academic curricula. The reality is that as the work environment becomes ever more hostile to great execution, the need for managers who understand how to make it happen becomes ever more pressing. Marketing guru, Theodore Levitt postulated that the “product” could be likened to four concentric circles. Starting with the innermost circle representing the Core product, the three outer circles represent the Expected, Augmented and Potential product respectively. In his article “Marketing success through differentiation – of anything”, he als o concluded that what one customer might regard as product Augmentation, another might see as Expected. It’s 35 years since the article was published in the Harvard Business Review and there is no doubt that the impact of competition and technology and the resultant rise in customer expectation has seen the migration of features that used to represent the Augmented product being regarded as the Expected Product and those of the Expected Product becoming part of the Core Product. Product quality is a given these days. So are such attributes as reliability of supply, competitive order lead-times, delivery-on-time and competitive pricing. These are the qualifying dimensions of any product or service and no supplier can perform below par on these attributes for any length of time. In Levitt terminology they are all part of the Expected Product. The real battleground between competing organisations is customer service and despite the growth in e-business, customer service invariably involves people. My company has completed customer/client feedback surveys for all manner of organisations from large multinationals to boutique consultancies covering every type of business from freight forwarding to stock feed and IT. There is always a high correlation between the respondents’ rating of the level of service they receive from their main contacts at the supplier (my client) and the overall Customer Satisfaction Index. But it is one thing to achieve high indices, another to maintain them. 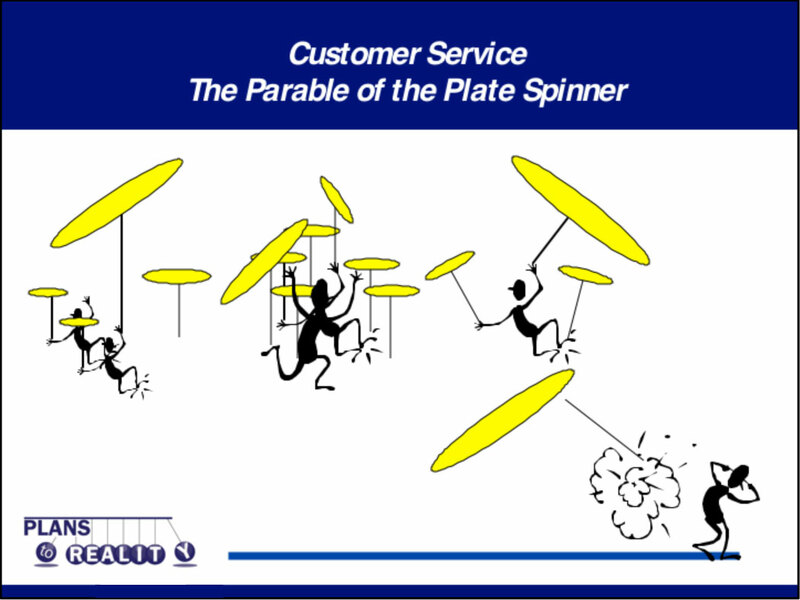 And to illustrate the nature of the challenge, I tell them about the Parable of the Plate Spinner. 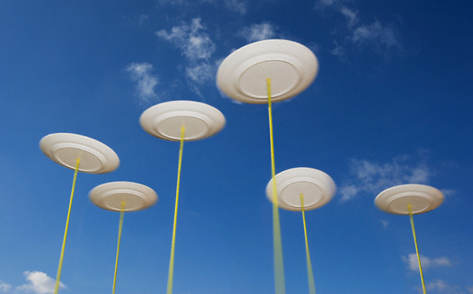 In the beginning, there was a plate spinner who became skilled at spinning an increasing number of plates. He was so successful that he was being asked to do shows every night and increase the number of plates he could spin simultaneously. This got to be too much for him so he decided to teach others to spin plates. Naturally, they were not quite so good as him but it enabled him to take the occasional break and when they all appeared on stage together, the results were truly spectacular. But then things started to go wrong. The number of plates to be spun kept on increasing and there wasn’t time to train the new plate spinners to the standard required. 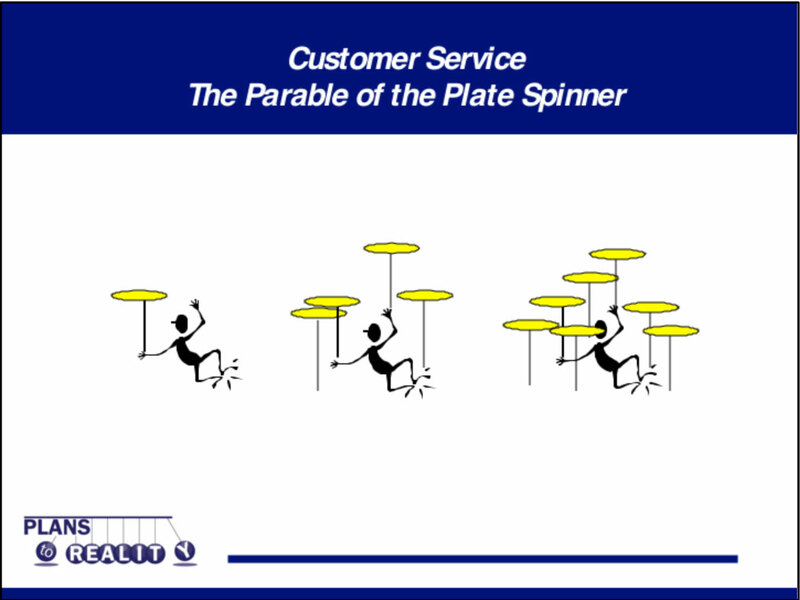 Instead of a set number of plates being the sole responsibility of one plate spinner, a system evolved whereby several plate spinners shared responsibility for the same plates. At times no one was certain who was responsible for keeping the plates spinning. 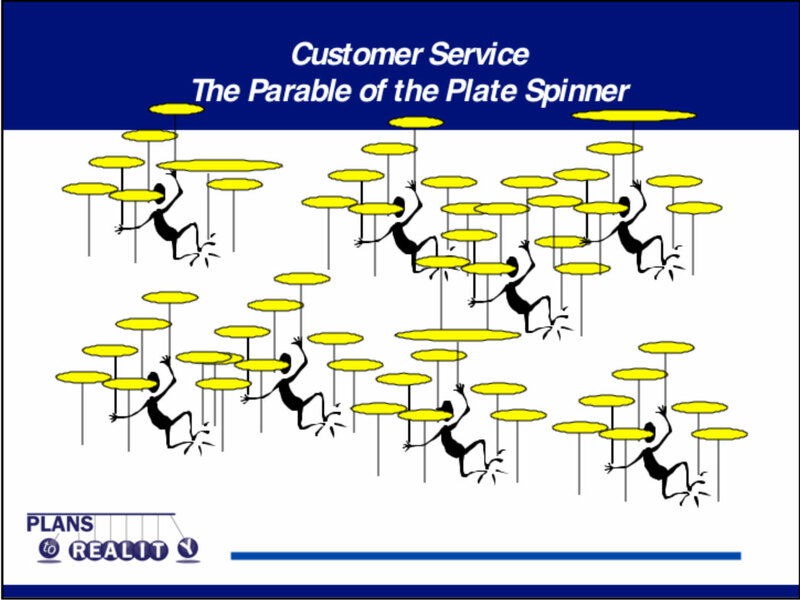 Last – but by no means least – they began to spin plates of greatly differing sizes and they found that large plates took up a disproportionate amount of the plate spinners’ time and resources – both to get them up and spinning and to keep them spinning without losing equilibrium. When a large plate started to wobble, it would require more than its fair share of spinners to reset it and the only spinners that could be spared were those who had plates that were spinning well. The result was inevitable. Whether or not the efforts of the spinners to restore a problem plate to equilibrium were successful or not, other plates, deprived of their regular re-spin began to oscillate ominously and inevitably some fell from their poles, never to be spun again – at least not by this troupe of plate spinners. The moral of this story is that when the quality of your customer service is of such a standard as to attract new customers, you have to increase the resources to provide the Core, Expected, Augmented and Potential product that they have been led to expect. Furthermore, the standard of service given to new customers must not be at the expense of the established customer base. Even the most stable plate will fall off its pole if you ignore it for long enough. 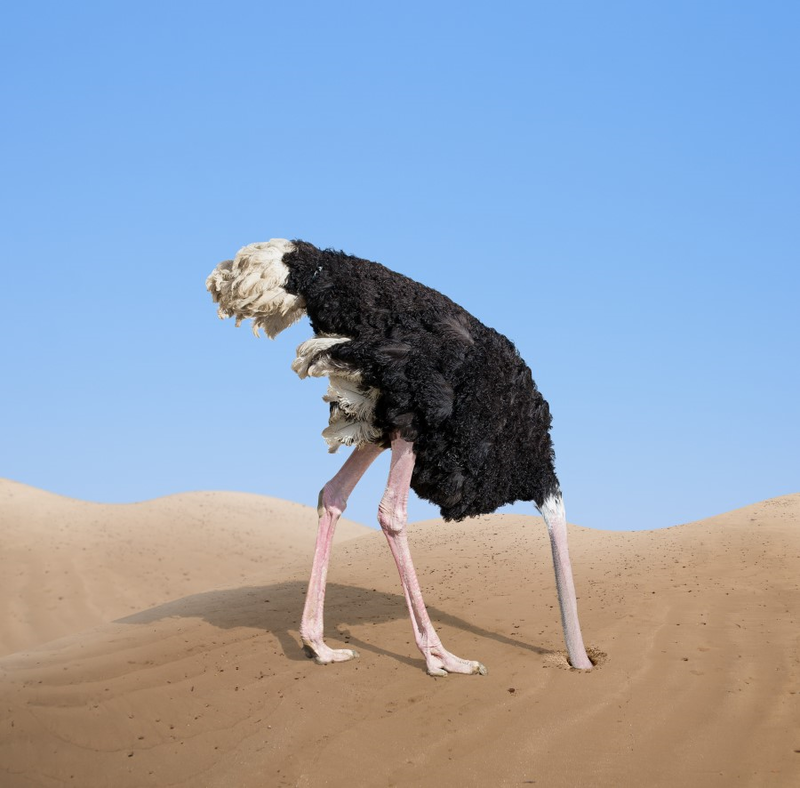 Always bear in mind the research by TARP (Technical Assistance Research Programs Washington DC) that showed that 68% of customers changed their suppliers because the supplier “appeared disinterested or indifferent to its customer’s needs”. Graham Haines runs his own consulting practice Plans to Reality and has been conducting his proprietary customer feedback surveys for over 20 years. The feedback from these surveys provides a key input into operational and strategic initiatives for improving the performance of any enterprise. You can read about these surveys and others covering executives, employees and workgroups at www.planstoreality.com.au. Do you have a corporate goal? I’m not talking about some corporate vision; in the first instance, I’m talking about a SMART goal, one that is Specific, Measurable, Achievable, a Result and Time-related. But a corporate goal should be much more than that. I recall a Director of a company that I worked for telling the assembled members of a regional office that the company’s goal was to make an overall 10% return on assets employed within three years. Were the staff energised by this revelation? Did they even comprehend what the Director was on about? And if, by some minor miracle, the answer to both these questions was “yes”, would they have understood their role in the goal’s achievement? To be effective – and far more effective than the vast majority of corporate visions – the corporate goal, in addition to being SMART, needs to display the following characteristics. As Rob Fyfe, ex CEO of Air New Zealand put it – ” A highly motivated community of people working cohesively towards a common goal with a shared sense of purpose …. will almost always outperform an opposition focused primarily on the bottom line, on financial ratios and technical superiority”. Does the above statement by Rob Fyfe mean that Air New Zealand doesn’t focus on profitability and other financial ratios? Of course not! But it’s not its primary focus and management believes that if Air New Zealand becomes the airline of choice on the routes that it flies, it will lead to higher load factors, less discounting, lower variable costs and ultimately higher profits. My conclusion is that if you look after your customers, the profit will look after itself. 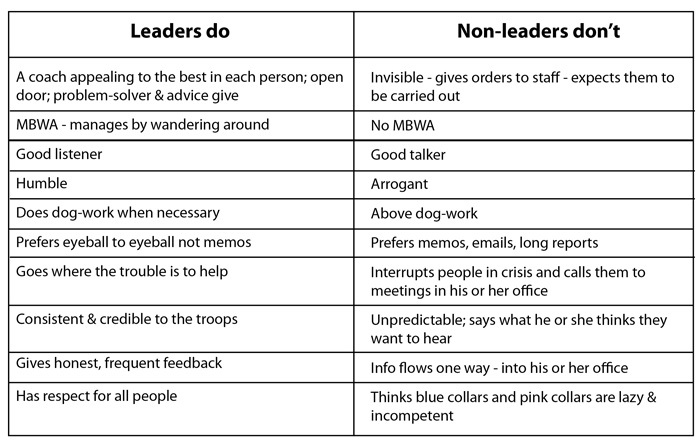 There is no room here to reproduce the complete list but I’ve selected just 10 which can be practiced by anyone who manages others at whatever level in whatever organisation. 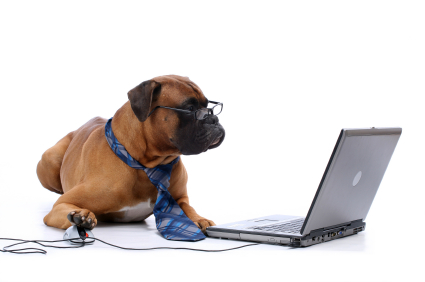 I’m going to pick just one from above – “does dog-work when necessary”. Heard about a NUM (Nursing Unit Manager) recently. She’s old school – she refers to her nurses as “my girls” and helps out with the bed making if they are short staffed. Then there’s Ray Creen, head of the NSW Ambulance Service. A paramedic himself, he still rosters himself on one shift a month. “Creen is well aware his staff respect him. He knows exactly what he’s doing when he puts on their uniform and goes out on their jobs. He’s not only practising the profession he loves, he’s nurturing the roots of his authority” wrote journalist Mark Dapin. The NSW ambos are so impressed they have built a Facebook page around him – Ray Creen – Ambo Legend. Morale in the service has risen to unheard of heights since he took the reins in March of last year. I’ll finish with Rob Fyfe, legendary CEO of Air New Zealand from 2005 to 2012. Fyfe’s unshakable belief was that people were more important than planes. “By understanding our customers better, …. we could win by attracting more customers to fly (Air New Zealand) and ensure we had fuller aircraft rather than trying to win through having a lower cost base, or some other miraculous way (of increasing) our revenue”. A highly motivated community of people working cohesively towards a common goal with a shared sense of purpose …. will almost always outperform an opposition focused primarily on the bottom line, on financial ratios and technical superiority”. During Fyfe’s tenure, he practiced as a flight attendant and as a baggage handler. As a graduate engineer, he was not averse to doing a night shift at the airline’s maintenance hanger at Nelson, nor did he shirk responsibility for answering personally any complaint emailed directly to him. Has his style of leadership worked? You betcha – Air Transport World voted Air New Zealand “Airline of the Year” in 2012; its profit last year was $182 million and climbing; 56,000 people applied for jobs last year at what is New Zealand’s most admired company. What’s the real lesson from these examples? It’s that when you behave towards your staff as you would like your staff to behave towards you and you set the example by MBWA and a willingness to do “dog work”, you will tap into the constants of human nature that cut across gender, cultural, religious and ethnic boundaries and job roles and status. As Top Gear’s Jeremy Clarkson would say – how hard can it be ….? Animal Migrations – Ultimate Organisational Alignment? You must be singularly immune to the blandishments of consultants and their training programs if you are unfamiliar with the analogy of migrating geese and the principles of teamwork. The message is appealing – divide your employees up into small groups, adopt the characteristics of skeins of geese and the resultant team will be much more productive with members enjoying far higher levels of job satisfaction and having – dare I say it – more fun. So is your organisation an exemplar of teamwork or have you found the theory hard to translate into practice? If the latter, I know why. In my Wagon Wheel Enterprise Operating Platform, team work is in fourth place on the list of key implementation factors and these are preceded by the first stage in the platform – Planning – deciding what it is you want to achieve and then working out how you are going to achieve it. The fundamental prerequisite to great execution is Organisational Alignment. The irony is that animal migrations, whether of wildebeest, birds or butterflies are excellent examples of organisational alignment but trainers and consultants have decided that there is far more appeal in the linkage between geese on the wing and team work than there is between butterflies and organisational alignment. The former stirs the emotions; the latter merely appeals to the rational. Dingle, an evolutionary biologist, identified five characteristics that distinguish migration from other forms of mass movement. His hypothesis was that these features are present, to a greater or lesser extent, in all animal migrations. They are also present in successful organisations. Take bar headed geese for example. Every year, these geese migrate from lowland India to breed on the Tibetan plateau. To achieve this, they cross the Himalayas, reaching an altitude of 21,000ft for certain with unconfirmed reports that they have been observed above Everest (29,029ft). Why fly across the Himalayas when they could outflank them? It’s hereditary behaviour – it’s hard wired into them. What we might call organisational culture. Migrating animals travel with a purpose. They don’t meander around. They confront obstacles and overcome them. Their focus is on the larger purpose – the organisational goal. 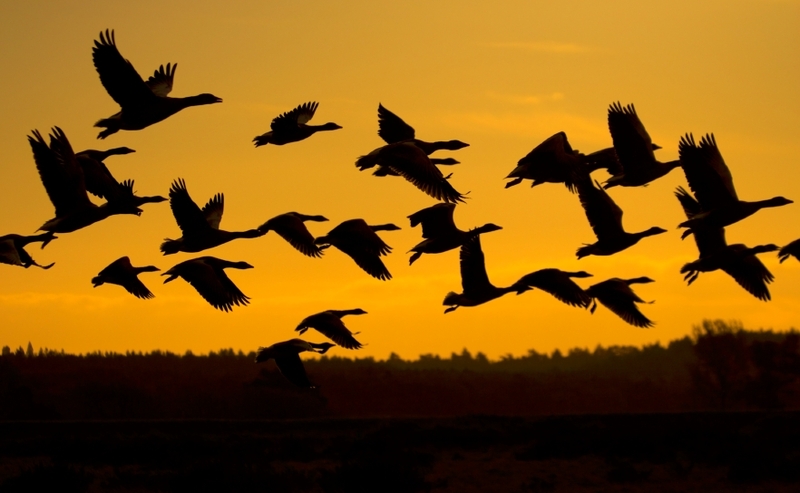 Migratory animals act in unison – they are all focused on the journey. They act as one. They are aligned with one another. They don’t go off and do their own thing just because it suits them. Whilst animal migrations are instinctive, they are also carefully planned. The animals gather in the same place, they depart at the same time and they agree on the destination so all know when they have arrived. If you are a bar headed goose then you will eat voraciously before the flight. But not only do you store energy, you have developed the physiology and strategies to conserve it. You have the species’ highest ratio of wing area to weight to maximise lift at high altitudes. You have a preference for flying to the highest altitudes at night since the air is denser at low temperatures and this helps lift. You use thermals to gain altitude and conserve energy. On the physiology front, you are capable of extracting more oxygen from the oxygen depleted air found at high altitudes and using it more efficiently than your lowland cousins. In short you have developed and acquired the resources necessary to turn your planned migration into reality. To summarise, therefore, every goose appreciates where they are before the migration; every goose knows the destination and understands the strategies required to get there and, lastly, every goose plays its part in achieving the goal. Now if you substitute “organisation” for “goose”, you’ve pretty much defined what is meant by organisational alignment. And the point is this. 90% of the reasons for the success of the migration occur before the geese take to the air. The way they fly in their “V” formations is the final stage of execution that maximises the chances of all of them reaching the Tibetan plateau. And so it is with organisations. Without comprehensive and involving planning; without goals and objectives; without a realistic plan of action; without organisational alignment; without empathetic management of change; without leadership at all levels of your organisation, the empowerment of your employees through the development of teams and teamwork will simply not happen. Instead, inspired by the grace of geese on the wing and won over by a seductive promise of organisational utopia, your employees will take flight prematurely, struggle to gain altitude, fly in ever decreasing circles, become ever more frustrated and ultimately touchdown in much the same location they departed from. They will then take on the characteristics of another bird – a melee of seagulls squabbling over the remains of your fish and chips. Do you have an operating platform? I’m told that the number of apps for SMART phones now exceeds a million; quite a contrast between that statistic and the handful of platforms and operating systems required to support them. Whilst not showing quite the virility of the mobile apps family, the market for training courses and consulting programs continues to escalate to the extent that no matter what your need, there is a product tailor-made to “fix” the problem. The trouble is that without an operating platform on which to run this type of applications software, there is a tendency towards treating the symptoms rather than the causes. Take, for example, a program on teams and teamwork. It’s a fair bet that the program will encompass team members’ roles, dealing with conflict, active listening, emotional intelligence, communication, team leadership and many other facets of what we instinctively recognise as team attributes. Games to foster and illustrate teamwork are played and sporting exemplars are tabled. The program might culminate in an address given by a well-known personality who headed a celebrated team. Fired with enthusiasm and keen to practice what they have been taught, the attendees return to their everyday work environment. After a few short weeks, the course is but a pleasant memory and the reality sets in. The work environment is simply not conducive to the practice of teamwork. Why is this scenario played out so often? The short answer is that teams and teamwork, or leadership, or employee engagement or customer service are all dependent variables. And if you trace their dependency back to their origins, they all end up at Planning. If you want to get maximum value out of your training budget; indeed, if you want your organisation to be successful – however that is measured – it’s essential that you have an operating platform that sets out the hierarchy of dependency. That way you know what parameters have to be satisfied in order to extract the maximum value from any “applications software” program and for your organisation to achieve success. The operating platform is made up of four components, the first of which is independent but with the second dependent on the first and the third dependent on the first and second and the fourth dependent on the three that come before. The platform has to be constructed in a specific sequence – you can’t build Component 2 until Component 1 is complete. They represent an operational cycle – when “revising” is necessary, it’s back to “planning” again. This component of the operating platform works like this. Organisational Alignment – everyone understands where the organisation is now – everyone understands the destination and the journey and everyone understands their role in getting there – is dependent on Planning. These three criteria should have been addressed at the planning stage. Next is Management of Change. Until the organisation is aligned, the changes required to achieve the organisation’s goals will not be known and hence cannot be managed. Now we come to Teams and Teamwork. There are two prerequisites for effective teams and teamwork. The first is that the team in question should have a clearly identified purpose and goal, both of which are subsets of the purpose and goals of the organisation as a whole. Secondly, the catalyst to team development is a “significant performance challenge”. Teams are a means to an end, not an end in themselves. Whether these two team criteria are met will depend on Organisational Alignment, Management of Change and Leadership. And only when they are in place will the applications software on effective teamwork have a platform that is conducive to its long term development. The last factor is Employee Engagement. Its position indicates that it is the most dependent of the five variables that together form the implementation component of the organisational operating platform. If the three criteria for Organisational Alignment are met; if the rationale for Change is understood; if Leadership is such as to accomplish the change required with the minimum of resistance and resentment; if the basics for effective Teams and Teamwork are in place; if team purpose and goals are embraced by team members – then surely the groundwork for engaged employees has been laid? Just as there is a hierarchy of dependency for implementation, a similar hierarchy exists for Planning. Most of the strategic planning that I see places too much emphasis on “this is what we want to do” with too little thought given to “this is how we are going to do it”. As a consequence, the resultant action program is based on the former rather than the latter. Executive management fail to appreciate that whilst strategic planning may be determined from above, it is actioned from below. The vital link between Planning and Implementing is Organisational Alignment. At the planning stage, OA is about aligning the organisation to its external environment and its internal resources. At the implementing stage, OA is primarily about the alignment of staff to the outcomes from the planning stage. At the Monitoring, Measuring and Adapting stage, It’s about both. 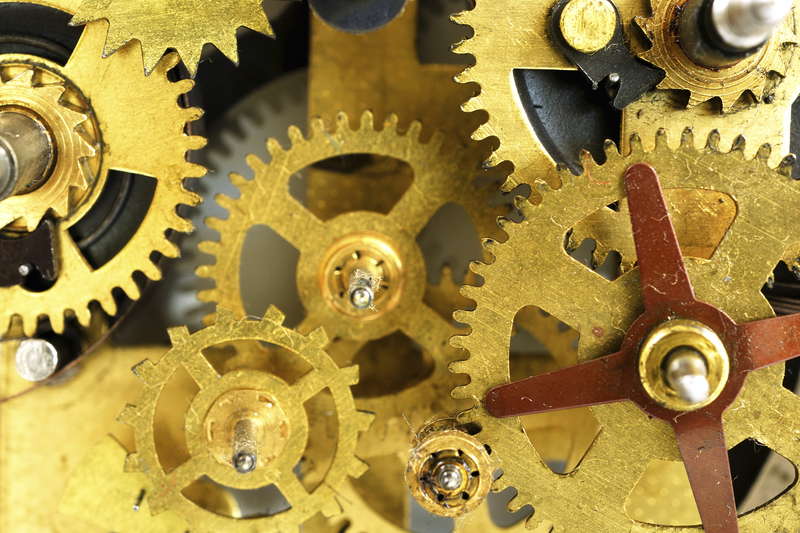 Understanding the interdependence of every facet of the operational cycle is no mean task. Realising that there is a hierarchy of dependency and knowing what order that hierarchy is in adds a further degree of complexity. That’s why enterprise operating platforms are few and far between but applications software continues to proliferate. Graham Haines is principal consultant of Plans To Reality that specialises in strategic planning and execution. He is the developer of the unique Wagon Wheel Way™ Enterprise Operating Platform. Graham has a joint honours degree from Durham University and a Graduate Diploma of Education from Melbourne University. He is both a Certified Management Consultant and a Certified Practicing Marketer. His new book, “Execution to Die For – The Manager’s Guide To Making It Happen” draws on over 40 years’ of practical experience in understanding the interrelationship between all the factors that result in great execution. His web site www.planstoreality.com.au contains upwards of sixty articles upon which “Execution to Die For” is based. You are currently browsing the archives for the Change Management category.